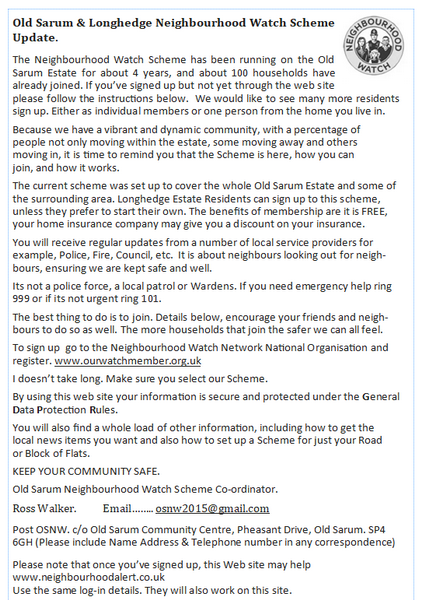 Old Sarum & Longhedge Neighbourhood Watch Scheme Update. 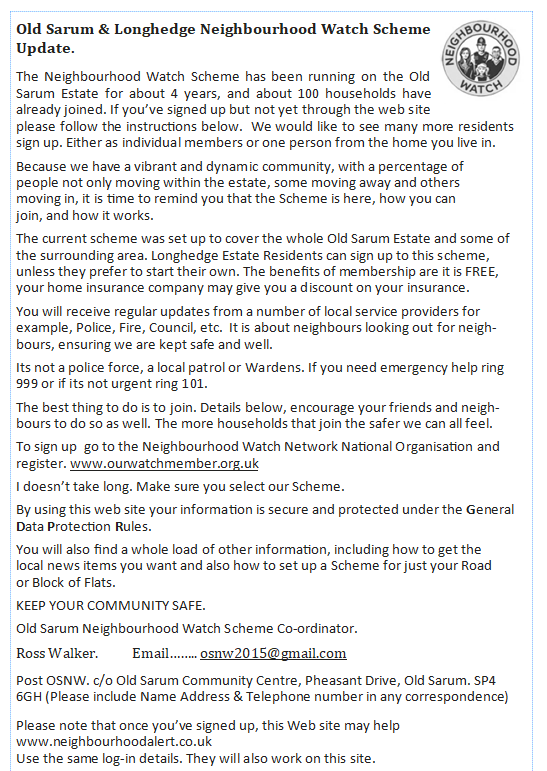 We currently have 79 volunteers who between them deliver the 4,200 newsletters every two months, but are short due to residents moving and an increase in new houses. We need volunteers to deliver newsletters in the area below. Can you help? • Longhedge -Any help would be appreciated as the estate grows in size. Do you have an Older Person’s Standard Wiltshire concessionary bus pass? The Council encourages applications from local community based, ‘not for profit’ or charitable organisations e.g. voluntary groups, societies, clubs (including new start-ups), sports clubs, youth clubs, playgroups, and community projects. Note: The application form is in Word Document format and will be downloaded to your download folder. 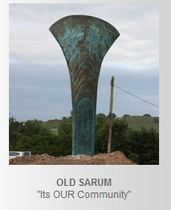 See the Old Sarum Community Website and newsletter here. The public enquiry resumed on Wednesday 13th Feb and was concluded the following day. The Inspector, Frances Mahoney, will now deliberate on what she has seen and heard. There is no forecast currently as to when she will be able to publish her findings. Details of the proceedings will be available on this website soon. See full details of earlier events here. "The Parish Council will continue to secure representation from the four communities and will seek further ways to improve its association with them for example by rotating the venue of Parish meetings." Future Parish Council meetings will be held at Old Sarum Community Centre, Hampton Park (Greentrees School) and Laverstock at River Bourne Community Farm on a rolling programmed basis. Residents can address the council with any concerns for up to 3 minutes before the meeting proper starts. Councillors, but may occasionally be referred to the whole Council. 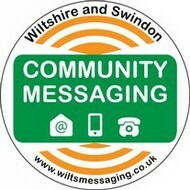 Full details may be viewed on the Wiltshire Council website. The RESPONSE is the view of the Parish Council and will be considered, along with other consultations, by Wiltshire Council, who will make the decision. Click here to see the table of applications. The Area Boards are a new way of working to bring local decision making back into the heart of the community. They are a formal part of Wiltshire Council that try to find solutions for local issues such as road repairs, traffic problems and speeding in villages, litter, facilities for young people and affordable housing. We are pleased to announce that Castle Hill Country Park has been transferred to the Parish Council. Now the hard work begins to nurture the Country Park, turning the spoil-scapes to wildflower-scapes and ensuring the special qualities of Castle Hill are preserved for future generations. Thanks to everyone who made our community art workshop and Country Park information drop-in on the 15th of April such a memorable event. There will be more opportunities to enjoy and learn about Castle Hill Country Park over the coming year as the Park continues to take shape. See the trail guides for Laverstock, Hampton Park and Old Sarum.